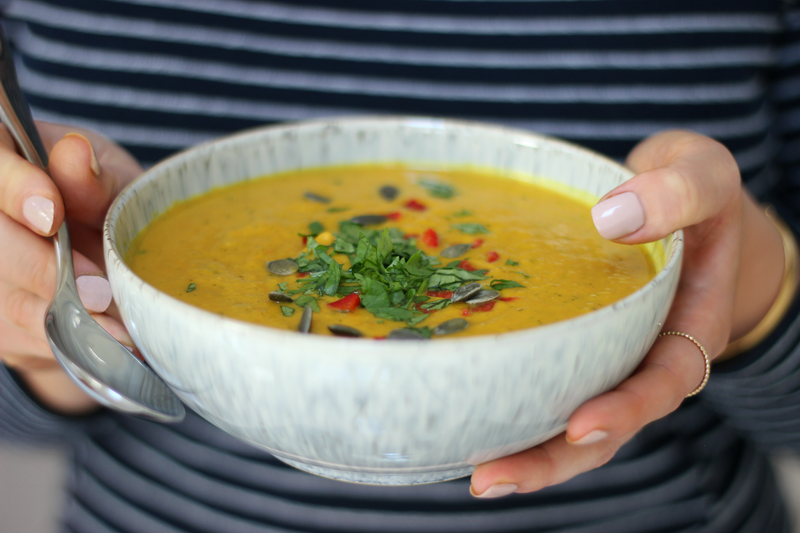 A warming autumnal, creamy sweet potato and coconut soup with a kick of ginger, fiery red chilli and fragrant fresh coriander which makes for a lovely, light but filling lunch or an easy week-night dinner served with some crusty bread or a couple of slices of toasted rye. I've usually got leftover ginger and chilli hanging about from the curries I cook up, so this is a great way to make use of them whilst creating something a little bit different. Chop the two onions then add them to a large pan with the olive oil and allow them to soften on a medium heat. Mince the garlic, add it to the pan and fry it off for a minute. Grate in the ginger, then finely chop the red chilli, reserving a few pieces to garnish and add that to the pan too. Fry everything off for a few minutes before then adding in the turmeric and frying it off for a further two minutes. Chop the sweet potatoes into roughly 2cm cubes and add those to the pan, mix everything well then cook that off for around 3 minutes. Pour in the vegetable stock and the coconut milk, then season well with salt and black pepper. Stir then bring it to the boil and allow it to cook on medium-high heat for 3 minutes. Turn the heat back down to low-medium, cover and leave to simmer for 20 minutes. Remove the lid, add in the majority of the fresh coriander then blend with a hand-blender or transfer to a food processor or blender, and blend until smooth. Heat again if necessary, serve hot and garnish with the remaining red chilli, fresh coriander and pumpkin seeds. Store in the fridge in an airtight container for up to 3 days. Freeze in an airtight container and use within 2 weeks for maximum freshness.